I already did a preview of the Set. You can check that post for product details, ingredients, price and other information. Link for Whole Lotta Color Preview. All the colors are sheer but I tried to put here the most intense color possible for all colors. These were possibly the toughest ones to swatch on lips so far. After clicking their pics 3 times and rejecting them every time, I did them again on Sunday and I am quite happy with the results got better results than the previous ones and I do not have patience to do 5 of them again for the 5th time! As I have declared earlier, I used them almost every day for around 15 days in a row. I had to reapply it a lot. While it looks awkward to reapply lipstick in front of other, this one looked like I am rubbing a huge crayon on my lips. And who never liked crayon? So, like a crazy kid I rubbed then on my lips. While they are moisturizing and balmy in texture, I wish they were little more pigmented. Anyone who have pigmented lips - which is like the most common issue faced by everyone in India - will face issues. All the colors might look similar. A peachy orange sheer color with gold shimmer. It’s the sheerest of all and hardly seem orange in fact. This is the only one which contains shimmer in it but they are hardly noticeable. Cool toned bubblegum pink. This one is quite opaque compared to other colors. Berry tones warm pink. This is the most worn color and most loved one. Its suits me a lot as a everyday n*de glossy pink. Red toned pink. Most opaque of all. Like it for the vibrancy in it. Brown. I have actually never worn it for a day. Only while swatching etc. This one will surely be the last one to finish or dare I saw will not finish ever. 1. Moisturizing and balmy in texture. 2. 5 colors to play. 3. Better value for money compared to 2 colors which will come for the same amount. 4. Will be loved by anyone who likes sheer colors. 5. Staying power better than most other tinted balm. Last more than an hour very easily. 6. Easy twist-up. No product lost due to sharpening. 7. Other than Oversized Orange none have glitter particles..
1. 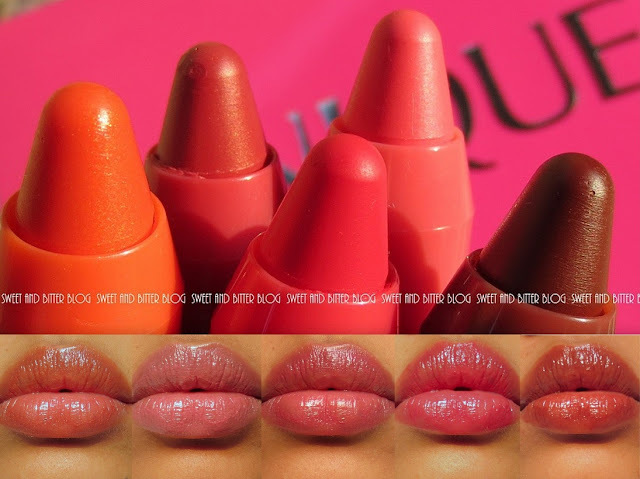 All colors make look alike on pigmented lips. 2. Had a smell when they were new (but now its gone). 4. Leaves behind no tint. Overall - I love the concept of chubby sticks. Lip color in crayon like twist up form is attractive. I also loved the concept of packing 5 travel size color consisting of all variety into a rightly priced gift box. I do wish they were more pigmented but I was aware of this issue when I got them so I am not complaining here. I'm waiting for the Chubby Stick Intense to be launched here. Those have much better pigmentation. I think I will wait for Revlon just bitten. They are much cheaper and intense in color. You lips!!!! Sorry, couldn't help :P The shades look wonderful on your lips!!! did u need some concealer or something under? ?